Clara Berridge’s research interests are at the intersections of critical gerontology, bioethics, and health care technology. She is interested in the social and ethical aspects of network-connected (IoT) technologies that allow caregivers to remotely monitor people where they live. Her work examines the ways diverse stakeholders interact with and assess these technologies. She also studies direct care work and surveillance practices in nursing homes and assisted living communities. Across projects, she’s often thinking about privacy, autonomy, power, and decision-making about technology use. Her research and teaching draw from science and technology studies (STS), medical anthropology, and disability studies. 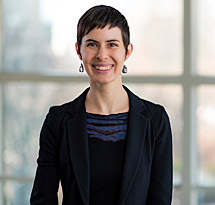 Prior to joining the UW School of Social Work faculty in 2016, Dr. Berridge completed an AHRQ Postdoctoral Research Fellowship at Brown University in the Center for Gerontology and Healthcare Research in the Department of Health Services, Policy and Practice, School of Public Health. She earned her PhD (2014) in Social Welfare at the University of California, Berkeley, with the University Designated Emphasis in Women, Gender and Sexuality and her MSW (2006) with a specialization in public policy and multigenerational practice here at the University of Washington. Dr. Berridge is an affiliate of the University’s Disability Studies Program, Comparative History of Ideas Program, and Center for Studies in Demography and Ecology (CSDE).